NovaBoard electronic exchange rate boards are stylish, attractive and eye-catching electronic devices that draw attention of many potential clients to your exchange rates or any other additional service that might be presented to them on one or two scrolling displays. Further more, curious clients who “just want to ask about exchange rates” are kept away from crowding your office. NovaBoard will display separate buy and sell rates for each of the currencies using 7 or 8 digits per rate. In addition to this, we offer optional time/date display and one or two scrolling messages across the entire board. We will customize the board with your logo and you can choose from standard colors and fonts to create the board that goes with your overall visual identity. NovaBoard with its exchange rates, scrolling messages, time and date can be easily confi gured and updated from your PC using user-friendly application “EKL” developed especially for this purpose. This model of exchange list is the smallest model in our offer. It has only 6 currencies, date and hour. It is created for banks that changing a small number of currency and exchange offices. Digits are height 13 mm and show the value of sell and buy rates. Time is in format HH:MM and date in the format DD.MM printed on something larger figures of 20 mm. All figures are red, are very legibly and easily noticeable from the larger distances. Exchange rate lists are intended for indoor use. They have elegant framework made of light gray anodized aluminum which will unobtrusive fit in your business space. Exchange rate lists are standard products with Ethernet communication, so they are easy to connect to the local computer network. Then it is possible to manage all exchange rates in the system with only one computer. All modern computers have Ethernet port so you don’t need any additional hardware. Exchange lists are delivered with free software that allows setting of time and date and daily rate. To start the software it requires Windows 2000, XP, or Vista. This model of exchange list is a standard model from our offer and it shows 10 currencies, date and hour. It is created for banks that change standard number of rates and greater exchange offices. Digits are height 13 mm and show the value of sell and buy rates. Larger digits, 20mm are used for printing time in format format HH: MM and date in the format DD.MM. All numbers are red, very readable and easily noticeable from a larger distances. Exchange rate lists are intended for indoor use. They have elegant framework made of light gray aloxite aluminum wich will unobtrusive fit in your business space. This model of exchange list, has a running message next to the 10 currencies, date and hour. It is created for banks that change standard number of rates and want to attract the attention of customers. But this model is often used in larger exchange offices. Digit height 13 mm show the value of sell and buy rates. Larger digits, 20mm are used for printing time in format HH:MM and date in the format DD.MM. Running message is in 8×85 pixels resolution and it can display any text. All figures and points are red, very legibly and easy noticeable from the larger distances. Exchange lists are delivered with free software that allows setting of time and date, daily rate as well as running text messages. To run the software it is required Windows 2000, XP, or Vista. The big sale of EuroJumbo is in progress – buy three, the fourth is FREE! Do not miss the opportunity because the action takes place only while supplies last. EuroJumbo is the most popular model of exchange list among the small exchange offices. Be different, attract attention and join the successful team! This model of exchange list is specifically designed for exchange offices and it displays daily rate of only one currency – euro. Large numbers, height even 57 mm, show the value of sell and buy rates. Digits are red, very readable and easily noticeable from the larger distance and able to attract the attention of passers. Whole device leaves the impression of professionalism and reliability, which every exchange office wants to leave at potential customers. EuroJumbo is intended for indoor use and there are as many as three options for installation at the ceiling, wall or table. EuroJumbo has elegant framework of light gray aloxed aluminum. Electricity is supplied through the adapter which is supplied with the device. This model is managed by remote control so it is quick and easy to adjust. 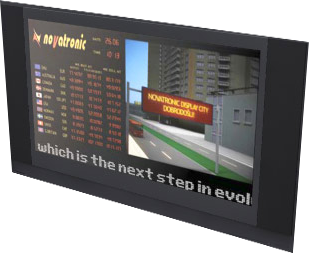 This attractive product is based on world’s most modern technology and has the possibility of displaying currency exchange, running messages, as well as arbitrary video with sound, all on the screen 32 inches or 40 inches in diagonal. Multimedia exchange rates are intended primarily to banks, but they are often used in other organizations that carry out exchange operations, and who want in their exclusive offices to have exclusive currency exchange lists enriched with additional multimedia content. Multimedia exchange rates are standard products with Ethernet communication, so they are easy to connect to the local computer network. Then it is possible to manage all exchange rates in the system with only one computer. All modern computers have Ethernet port so you don’t need any additional hardware.